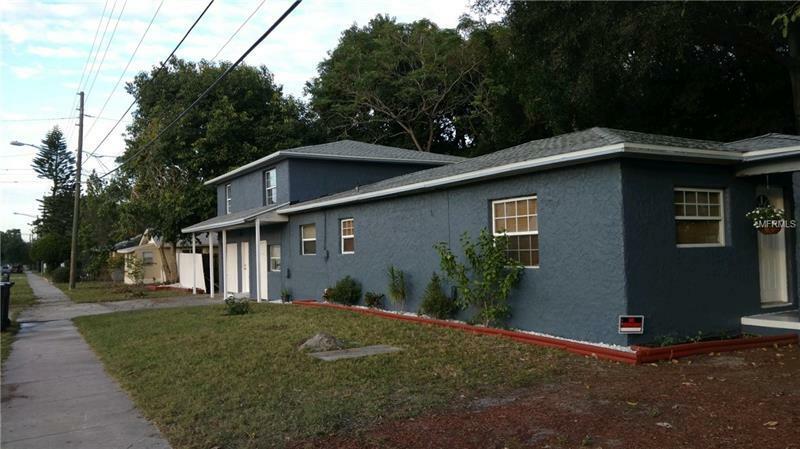 Great opportunity to own a triplex in desirable North St Pete. Three 2 bed/1 bath units. 1 car garage can be utilized for just 1 unit or storage for all 3 if divided. New roof 11/2016, new landscaping, new exterior paint, new keypad lock entry on all 3 units. 2nd story unit (C) is move in ready with new AC system 2018, new hot water heater 2017, new kitchen cabinets 2018, new granite countertops 2018, refinished hardwood floors 2018, new tile flooring in kitchen & bathroom 2018, remodeled bathroom 2018, updated interior doors, new baseboards throughout, added additional closet for storage. 2nd story unit is currently owner occupied. Ground floor unit (A) renovation has been started & will need to be finished. New hot water heater 2018, brand new drywall throughout 2019, updated electrical throughout 2019, updated bathroom-fixtures, vanity, mirror, refinished tub & tile. Ground floor unit (B) needs more work than unit A & will also make a great rental once completed. **Please note that there is only one unit currently rent ready** All measurements are approximate & should be verified by buyer or buyer's agent.